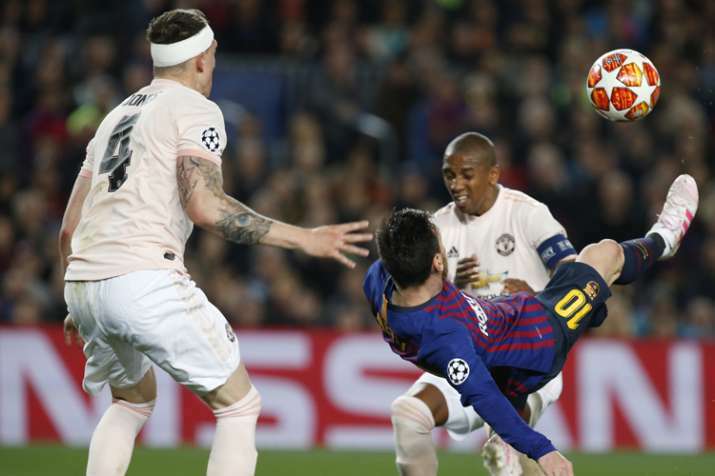 Messi scored two early goals to help Barcelona beat United 3-0 on Tuesday and reach the Champions League semifinals for the first time in four seasons. Lionel Messi made sure there was no memorable Champions League comeback for Manchester United at Camp Nou this time. Messi scored two early goals to help Barcelona beat United 3-0 on Tuesday and reach the Champions League semifinals for the first time in four seasons with a 4-0 aggregate score. United had arrived at Camp Nou hoping to take inspiration from its Champions League final victory twenty years ago when current manager Ole Gunnar Solskjaer capped a comeback against Bayern Munich by scoring the winner in injury time. Ajax stunned Ronaldo's Juventus 2-1 to progress to the semifinals in Tuesday's other match. Donny van de Beek cancelled out Ronaldo's opener before Matthijs de Ligt took the winner to let the Dutch visitors advance 3-2 overall. "We started well in the first 15 minutes and I thought, 'We've got something here,'" Solskjaer said. "But then they scored twice in four minutes. ... You could see the difference between the teams tonight. The quality of their finishing was absolutely outstanding." Messi went close to setting up another goal just before halftime. He made Phil Jones dizzy by changing the direction of his dribble three times. He then played Jordi Alba wide, for the left-back to cross the ball to Sergi Roberto arriving at the far post. De Gea made a superb save to block his point-blank effort on the line.